I have recently had the chance to explore a ‘technology preview’ 1 of the next version of Shiira and can happily attest that this will be a very exciting release!It still has a way to go before matching the stability and functionality of its predecessor, but for what appears to be a complete rewrite, it is certainly advancing very quickly.What follows is a somewhat in-depth review highlighting new features, revised features and missing features of the new build in its current form—it is important to remember that this build is not even at an alpha stage, nor has it been released to the general public at this point, bugs and rough edges are not only present but very much expected. Features and functionality could/will change at any point in the future. ‘Explore’ is certainly the keyword with this pre-release build, as it still requires a great deal of localisation—much of the interface is still in its native Japanese. But with the help of Google’s Japanese to English Language tool, a rough translation is only a selection in Interface Builder away. Weighting in at only 4.8MB, Version 2.0 is a little lighter than previous builds and could be a direct result of a new, cleaner code base, but I suspect it is more likely due to the reduced selection of features currently operational in this latest build.So how does it stack up?Tab Exposé - F8 One feature that debuted exclusively in Shiira; Tab Exposé, which was inspired by Apple’s Exposé, has gained some much needed speed optimisation as well as such niceties as bezel-based user feedback, displaying the page title and URL details on mouse over. Along with the traditional ‘F8′ key command, Tab Exposé can now be activated via a small icon in the status bar. It might be worth mentioning that this novel approach to working with tabs has made its way to Firefox via a plugin called FoXpose which provides similar functionality to Shiira’s Tab Exposé [ for version 1.4 and later ], should that be your browser of choice.Unfortunately, due to a strange bug switching between tabs via Tab Exposé in the new 2.0 preview only works consistently with between 2 and 5 tabs. 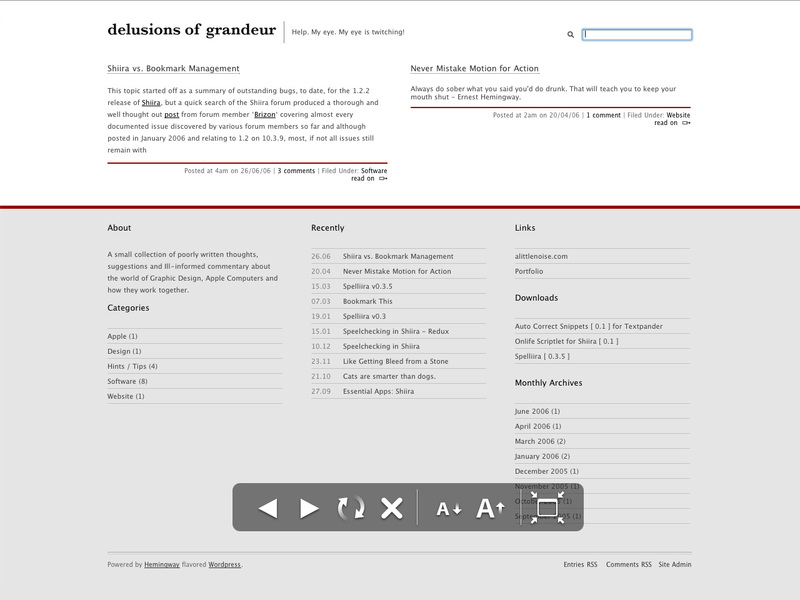 When making a selection with 6 [ or more ] tabs open, Tab Exposé often returns the user to the original tab displayed when it was invoked, rather than the new tab. Having the PageDock within the window bounds eliminates any confusion immediately.Shiira’s implementation isn’t perfect however—thumbnails can’t be dragged between windows [ exhibiting the same behaviour as normal tabs ], you cannot select or drag multiple thumbnails and there is no user feedback when mousing over the ‘close tab’ button like in previous versions, but my biggest concern, like with the Sidebar, is orientation. 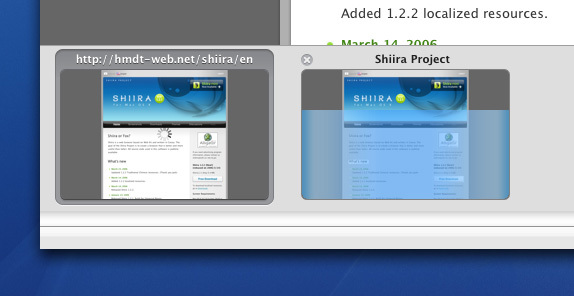 In this case having the PageDock to one side would be more appropriate with today’s wider screens.FullScreen Mode Shiira now also offers a fullscreen mode where, as the name eludes, will render a full screen version of the current page, removing all interface chrome [ excluding the scroll bar if it is required ]. Safari and Firefox users have already had this functionality available in the form of plugins for some time [ Saft for Safari and Full Fullscreen for Firefox ], but Shiira is the first major OS X browser, to my knowledge, that has this build-in.With fullscreen mode invoked, the Menu bar is still available to provide access to the File and Bookmark menus et cetera and drops down over the WebKit view [ rather than forcing the page to drop down with it ] when the mouse enters the first row of pixels—similar to how a hidden Dock is shown when moused over 3. While convenient, access to the Menu bar ensures this is just a fullscreen mode rather than a secure Kiosk mode [ cf. Saft ].Navigation is handled with a Quicktime/iPhoto style OSD bezel which offers a basic, but essential set of functionality [ back, forward, reload, stop, return to window mode, increase/decrease text size ]. This bezel is drag-able and can be repositioned anywhere on screen where it will fade out when the mouse is not in use. A Tab Bar is present for switching between tabs when in traditional tab bar mode, but nothing is offered when using the new Page Dock method—switching via a keyboard shortcut will be essential!The Shelf The new version of Shiira no longer uses a Drawer to display Bookmark, History and Download information, these items, and the search engine can now be found in a full window/tab view called the ‘Shelf’. This approach follows traditional methods of management adopted by most other major browsers [ cf. Safari, Firefox, Camino et cetera ] and provides a great deal more room to work with and display this information. Having recently commented on how Shiira deals with bookmark management, I was particularly interested in how the Developers addressed this in the newer build.Some of the ideas discussed in my previous post seem on target, users will have the option of both a list and a column view for managing Bookmarks and History [ Update: A newer build [ 060710 ] 4 has been released, column view has unfortunately, been removed from the Bookmark section of the shelf ] and for the most part works exactly as described.The History and Search Engine sections are unfinished and offer no information in regard to either the layout or features planned. Further inspection of the application bundle indicates each section of the shelf is separated into smaller bundles of code—a plugin within a plugin approach, which could allow individual modules to be easily updated independently from the main application.While there doesn’t seem to be any added functionality, at this point, to the sections that do work, there does seem to be some room set aside for expansion, in fact the newer 060710 build adds a split view between the bookmark listing and the selected bookmarks details.Sidebar Disassembled The demise of the Sidebar will no doubt draw some criticism—For some it was the reason they moved from other browsers to Shiira, for others it was merely convenient. Then there is the group that intensely dislikes it.Regardless of which group you belong to, it is now gone.In its place is a series of semi-transparent, Aperture style HUD palettes which can be called to display information about your Bookmarks, History and Downloads. A fourth palette, entitled ‘Page Info‘, is also available and offers information about the current rendered page including encoding and load time. The Page Info palette is split into three tabs, ‘General’, ‘Links’ [ a listing of all the links on the page, including mailto: ] and ‘Images’ [ currently non functional ], to help consolidate and manage this information.And for those users who can’t live without their bookmarks visible, a combination of a resized main window and a long, thin bookmark panel to one side will offer a similar solution to the current Sidebar.Something I do hope is addressed shortly, is the inability to search this information [ Bookmarks, History, Downloads ] either from within these palettes or with the Shelf. This is really the only chunk of functionality not carried over [ other than the ‘Page Holder’ and ‘RSS feed’ Tabs ] from the current Sidebar.A Plugin API A listing of plugins, currently only two—’preferences’ and ’shelf’, can be found in the Plugins section of the ‘Get Info’ panel 5. 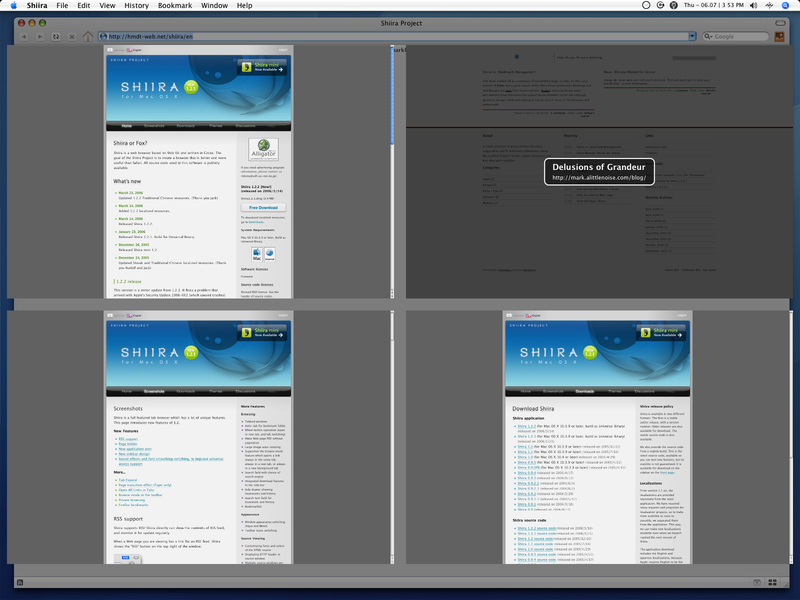 Each plugin can be toggled on/off here with changes taking place on the fly, without the need to restart Shiira. 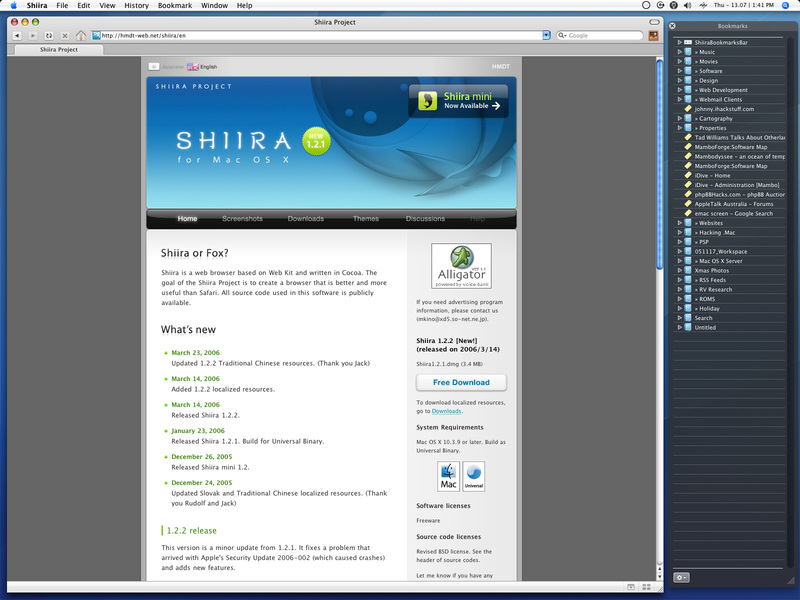 This signals a move to a more flexible, approachable code base and will provide the hooks required for other developers to add small chunks of functionality.The Preferences Pane The new build is also sporting a re-designed Preferences pane and following the HIG style set by the System Preferences in Mac OS X 10.4.x, Shiira has a ‘icon in window’ based approach to displaying this information rather than the ‘icon in toolbar’ method of 1.2.2 and earlier. Much like the structure of the Shelf, the Preferences pane is made up of a collection of smaller functions [ *.pref ] bundled within the main Preferences Plugin folder which in turn is bundled within the main application package.Some preferences are not currently active [ ‘Theme’, ‘Plugins’ and ‘Advanced’ ], others have just been re-shuffled into different categories, [ most of the ‘Advanced’ pane is now found in the ‘Universal Access’ pane ] and then there are some that warrant completely new categories [ ie. Plugins and Key Bindings ]. Most of the preferences are still displayed in Japanese making a full assessment difficult, but it seems most of the previous releases’ configuration is retained, including the bizarre ‘Page Transition Effect’—which now offers a choice of which side the transition should start from. While the options are present, not everything works or is implemented fully at this stage. 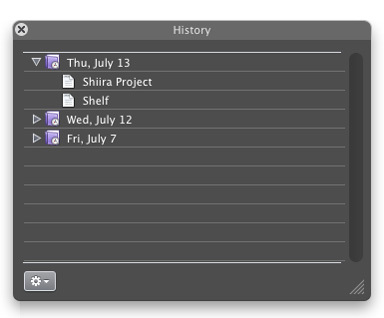 Expect more and more functionally as these sections are completed.Missing in ActionA few of Shiira’s main features are still missing from the newer build, one of which, is support for the notification system Growl. Version 1.2.2’s support was limited to notification of an updated RSS feed and a completed download, the latter I grew to depend on quite heavily. Other users like me will be happy to know that the growl.framework is included in the application package suggesting that support may come in a future release. Also missing is the management and creation of custom search engines. Although present as a section in the shelf, there is absolutely no interface, making it impossible to define new engines. Existing engines are available from the popup menu in the search field however, but unfortunately, searching via keyword in the location field is not currently supported. RSS support is also noticeably missing. Where earlier versions has support for rendering RSS feeds in both html [ cf. Safari ] and with Quartz 6 [ cf. Apple’s RSS Visualiser Screen Saver ] the newer build only identifies pages that offer RSS feed links with a small Firefox style RSS icon in the status bar—clicking this icon renders the icon in a Mac OS X ‘Tiger’ blue.Other features missing include, the ability to display Safari / Firefox bookmarks using Shiira’s built-in bookmark parser [ the interface is there just not complete ] and the export bookmarks as html function [ again, a menu item is there, just greyed out ].ConclusionSome key functionality is still missing from the new prototype build making it unsuitable for daily use, but it does provide a great insight into where Shiira is heading. The projects original goal of creating a better, more useful browser than Safari now seems a little short sighted—Shiira has, and continues to evolve into a simple yet powerful alternative to all other major browsers. Version 2 looks to be an extremely well considered application that just requires a good polish and a little more attention to detail before it’s ready to be released to the general public. New features such as Tab thumbnails will certainly be a welcome addition to the feature set as will the inclusion of the new plugin API, while those that came for the Sidebar will no doubt be disappointed that it is no longer available in the newer builds.With the new release—by my estimation, still a good few months away, It might be nice to see some of these improvements find their way to the 1.x branch—or at least, a solid bug fix to address the outstanding issues reported in the forum.Now, if only the forum could benefit from some of that attention. Shame the column view from Bookmarks has gone to serve nested folders. Does the ‘Shelf’ reveal from a toolbar or bookmarks button? The behaviour of Flock, which creates a new tab in addition to those windows/tabs open I have found slightly irksome, or does it reveal in present window? By the sounds of it, the RSS feeds may be treated very similar to Flock as well, which in this case would be a good thing, hope so. I like the HUD pallete method of display - SunriseBrowser were/are doing interesting things along these line with their TestBrowser. Love to get my hands on a build! Being fairly early in the development cycle, maybe column view will return in a future build. The ‘Shelf’ can be called from the toolbar icon [ as seen in the ‘Sidebar Disassembled’ thumbnail above - the wooden bookcase with a drawer ] as well as typing “shiira://shelf” [ actually ’shiira://’ will do it.. ] in the URL location field. Unfortunately, I was unable to find reference to it or a key command in Shiira’s menus. The Shelf is then rendered in the current tab view rather than creating a new window/tab and inserts itself into your History. RSS feed recognition has only made an appearance fairly recently so it is difficult to grasp a full understanding of how it will work at this early stage. How does Flock handle RSS? I haven’t been following it’s development that closely. Ah, sorry seen the Shelf button now. This behaviour of revealing shelf in the same tab seems more logical somehow. 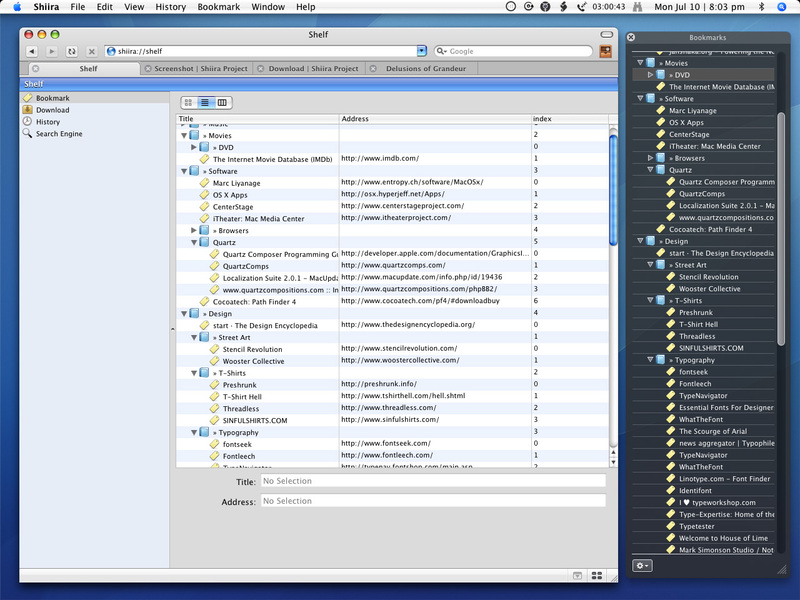 Here is a screenshot of the way Flock displays RSS feeds - very clean and looks very Shiiraish! That looks really clean. I like it. Shiira as a RSS feed reader has never really worked all that well for me [ I tend to use Vienna, but have recently moved to NNW as Vienna started choking on the number of feeds I have ], I would really like to see a nice, simple [ and logical.. ] approach with good theme support in the next version—Shiira needs a decent community built up around it [ like PMS! ]. Something like feed themes could be a good way to get people involved [ just need a text editor as opposed to say, a image editing app when creating icon sets ]. you’re talking to the coding dim-wit here! Man alive, I cannot wait for this release. Any idea how far away we are from seeing this for ourselves? Any idea how I can get my hands on Shiira 2.0? There’s been a screenshot of it on MacThemes Forums already. And it’s looking awesome.. The version reviewed was indeed a June release. Since then however, there has been two newer builds—and others might be pleased to know column view has returned to the bookmark section of the shelf. Other changes include initial support for Download and Search Engine sections in the Shelf. Unfortunately, I have no real information on an official release date, but I suspect it will be a few months away yet. @Pat: I would be happy to let you know when the public beta is available..
I’m really looking forward to trying this out. It looks to be quite awesome. As for a fullscreen mode Opera has had a fullscreen mode for sometime now in OS X (ever since version 7). Also has a full kiosk mode as well, but I admit it doesn’t have as cool a browsing menu as the new Shiira will :D.
I too would love to get my hands on Shiira 2.0. Just from the screenshots, I can tell that Shiira 2.0 is going to be a very beautiful (if not the most beautiful) browser on the Mac. I’m really digging the small glyphs along with the use of HUD panels. Just one thing: keep the tab thumbnails on the bottom. Loosing the space on the bottom of the window isn’t much of a problem since its easier to scroll up/down rather than left/right (a la OmniWeb tabs). Great review! I’m totally sold on Shiira once it hits 2.0 (Camino is pretty damn good but it really has some features I miss from Firefox such as more robust tab options). Shiira seems a bit clunky right now, as far as the interface goes, but 2.0 looks brilliant. I’ll stick with Camino until then! Please add me to your list of people to inform when a public beta is available! Wonderful review — I’ll have to download Shiira once I get around to buying my new MacBook. Also happy to find a good looking alternative to major browsers like Opera and FireFox. Can’t wait for it, looks awesome! I’m glad they got some new UI guys, looks very slick. Amazing! Someone *cough* send a preview for me to review sometime It looks look Shiira will have a little of everything [that I’m looking for in an OS X web browser]. Nice preview. Those look like some really neat features. 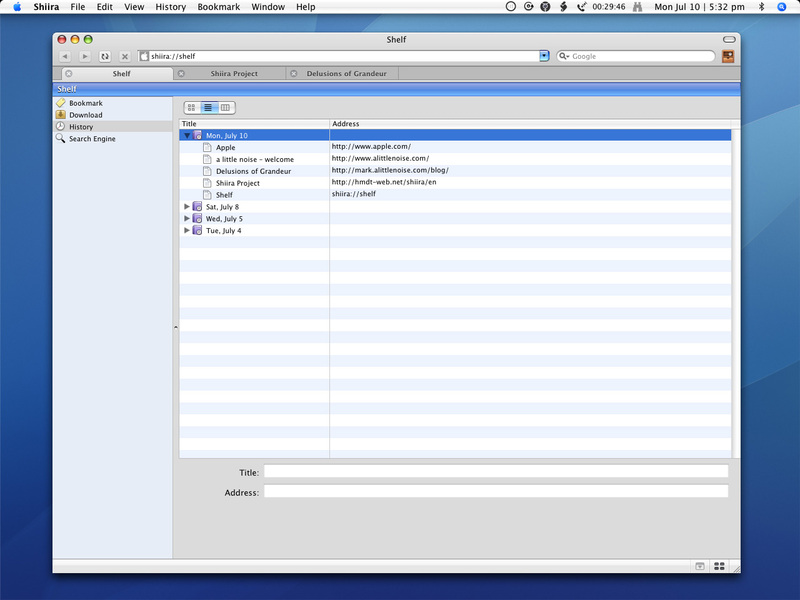 It all looks very clean and well implemented too in full OS X style. I’m going to check out foXpose in the meantime! This is looking most promising. One feature that I hope they include (or obtain Shiira suppport from the developer) is Inquisitor. Apart from this, and sharing the hope with you that the tab thumbnails moves to the side of the screen rather than the bottom, the browser looks like a strong candidate to become my favourite. This looks great, it’s about time the browser market had another shake up. Whoa—I hadn’t imagined this review would be so popular, thanks to all the 9,150 odd digg users that visited this afternoon! and to all of you that have left feedback and comments on the site. It’s good to know I am not the only vocal Shiira evangelist out there.. thanks again for the interest! @Dustin: Thanks for the heads up about Opera, I can’t believe I didn’t notice that, Opera Mini is my browser of choice for my 7610. @Gino: Ultimately, I would like to see an option to assign an area for the PageDock [ much like the Systems Dock’s preferences ] to each edge of the browsers window. why not make everyone happy? @Derek: Hey, you do the rotated thumbnail thing too! @Marcus: I would be really interested in this too—Someone mentioned the idea of Shiira support in a comment on Dave’s blog. His response wasn’t that promising..
Shiira support is exceedingly unlikely. The numbers do not justify it. I know Camino support proved trickier than expected as the search field is a custom class, but with a Plugin API and an Open Source code base, I hope Shiira gets a second look. @everyone else: Send me an email if you are interested in the public beta and I will happily notify you once it is announced. Wonderful review. I would definitely give Shiira a try when it is released. Any chance for Trailblazer-like history capability. This is the feature I have been waiting to make it into some complete browser but haven’t seen as of yet. @coelomic: it’s correctly. i will try this browser, too. many interessting features are see here and i hope, this project will be go away for long time. I’ve used version 1 of Shiira and wasn’t very pleased with it but this looks really interesting. I love Camino because it looks great and is very easy to use. I hope they won’t put to much functionality into Shiira v.2. And I must say I really love the design of this site. So clean and beautiful. Two thumbs up! Nice review. Is there any indication that they will allow you to save the open set of tabs between relaunches of the browser? That’s a feature I’d really like…but a lot of the stuff they are adding looks great! I would like to get a hold of that build, but can’t find it anywhere. Could you post it on this site or email me the link of the build. I would like to help develop the browser. Thanks for the review. Although I don’t use it as much as I once did, I have a soft spot in my heart for Shiira, and it looks like it’s getting better all the time. @John Blaze: Source code [ for 1.2.x ] is available from the front page, should you wish to start with that - but it is best to contact the lead developer Makoto Kinoshita directly to register your interest. man this thing looks like bomb! any eta yet? one note of interest. i would much prefer the visual tabs be on the left or right so i can easily use my scroll to see all tabs. one more would be the possibility of having a similar bar on the left with bookmarks. for use guys w/ 23″ screens it would be nice to have both equal and each side of the main browser window. Looks fantastic. Am gonna stick with Camino till shiira v2 is released. Pretty cool stuff. I really look forward to an Omniweb-like Tab Dock in Shiira, but would definitely want to be able to select multiple docked tabs at a time and drag them between windows. The Safari extension, Safaristand offers this functionality, and is the reason I use Safari for the majority of my browsing needs. 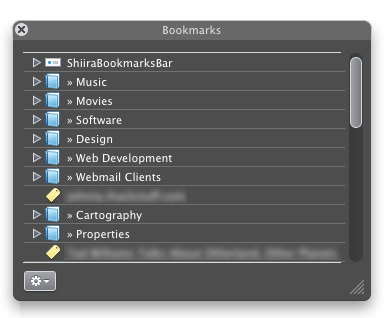 If Shiira 2 offered this, an Omniweb-like bookmark shelf (also a feature of Safaristand) and rendered HTML faster than Safari I would definitely make Shiira my systems default browser. In any case, there will allows be a place in my applications folder for Shiira. Shiira 2 is looking pretty good. And hopefully it will really pick up in terms of custom additions and things, cos right now the only thing holding me to Safari is Saft and a few other plug-ins. One thing I have to ask for is keeping the “tub” style of tabs. I just love it, and if it goes ill miss it. The PageDock is kinda useless on widescreen systems at the moment ; the whole point of the OmniWeb design is that takes advantage of the fact that most websites are longer than they are wide while the display is the opposite. I’m sure they’ll fix up Growl support. Man this browser is fast! I can’t wait for 2.0!!! Shiira is already awesome, the only feature lacking from the current version is Keychain support. Thanks for an excellent, detailed preview. I only heard of Shiira’s existence at the same time as finding this page, so I’m only now getting to know the existing version. I must say I’m enormously impressed, and your preview suggests that I’ll be even happier when version 2.0 is released. Looking good, when is the release? I hope the support of right to left languages is addressed. What about plugins? for .ram & .wmv? The latest build finally has some rss support. It’s looking pretty good. Do you have an Intel Mac - and can you run the latest nightly 061004? Unfortunately, I do not have access to an Intel machine to test the new nightly… I hope mkino adds PPC support very soon! thanks…are they still alive??? when do you think they will release? they are loosing momentum and it’s a shane because it’s an amazing browser. 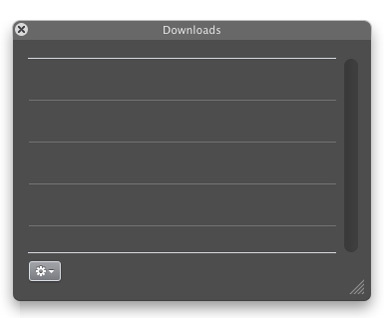 also, where you can download nightly builds? Yes, they’re still there and the official site is now sporting the beta2. For Nightlies keep checking http://prdownloads.sourceforge.jp/shiira/ although it’s the same version as the main at the moment. 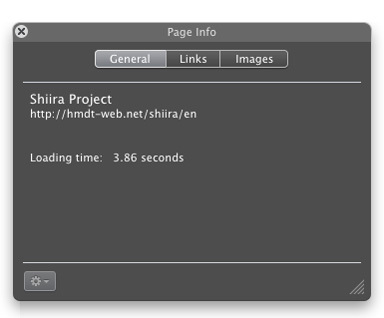 I used to be an avid fan of Shiira after experiencing some problems with Safari. But I’ve been experiencing problems regarding tabbed browsing through Shiira. So I switched to Firefox. I hope you can include lists of solutions to probable problems that may be experienced with Shiira. One bug related to Shiira is its incapacity to recognice umlaut – accent associated with French or German words. This is most encountered when viewing web sites written using the said languages. Any solution to this? A small collection of poorly written thoughts, suggestions and Ill-informed commentary about the world of Graphic Design, Apple Computers and how they work together.